About eight hours after a sleepless 15.5-hour airplane ride, I found myself on a mat next to about 30 beautiful people at Pure Yoga HK. No one forced me there – it seemed like a good idea at the time. “It’ll be great!” I convinced my kind husband, who by now is used to my overly-enthusiastic travel habits. The Pure studio, on the 33rd floor of a high-rise in Central, was beautiful. A wall made entirely of windows would have revealed a stunning cityscape had it not been 100% fogged up and dripping with condensation from the humid heat in the room, even though no yogi had moved yet. This should have been my cue to exit, but since my husband and I had each paid the $50 drop-in class fee, I decided to take my spot on one of the matching mats. (You read it right – fifty. We were unable to tell whether this was because Pure wanted to discourage drop-ins, or whether this was their usual rate for unsuspecting gweilo visitors. Also, due to my lack of understanding of the exchange rate, I didn’t quite figure out just how much the class cost until I was deep into the warrior IIs. One more reason why math matters, kids!). I am only here to tell this story because I escaped about 37.5 minutes into the hottest, slipperiest, most posh hot yoga class I have ever attended; this one goes down as the most expensive fraction of a yoga class I have ever taken. There was nothing wrong with the class itself—it was a typical hot vinyasa class with soft music playing in the background, led by a capable teacher. It was all me – I couldn’t keep it together. I was sliding off the mat, perspiring every ounce of water left in my travel-dehydrated body, and experiencing all the sorts of non-yogic projections toward the teacher Seane Corn warns you about. Afterward, my husband (who managed to make it through the class, which I attribute to his Lebanese/Asian genes’ ability to tolerate heat and his love of a challenge) said the teacher was very kind and encouraging, and he enjoyed the class and the yogi friends he made afterward. 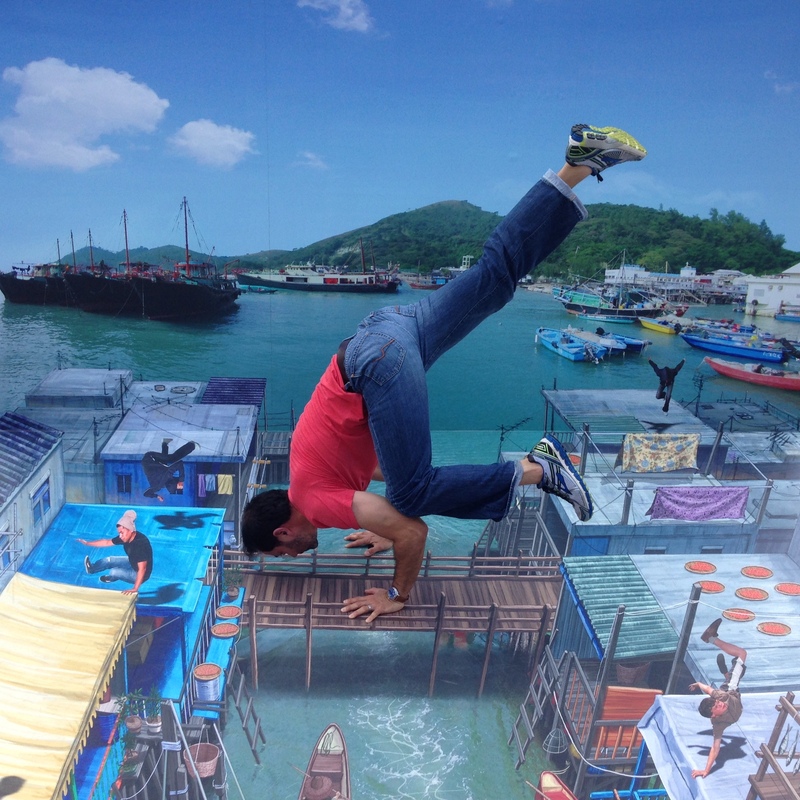 Deep Water Bay, Hong Kong, where many locals can be seen exercising in the morning. One thing that happens when you develop a regular exercise routine is that when you travel, you try to integrate your workouts into your travels. As our yoga practice has grown, my husband and I have come to enjoy practicing wherever we go. Because we are the kind of travelers who like to take it all in (and by that I mean, eat our way through as many regions of the world as possible), maintaining an exercise routine is not just enjoyable, but also serves as insurance of sorts. To date have practiced everywhere from Vancouver to Palo Alto to Lima, so naturally last November, when we traveled to Hong Kong to visit family, we set off to find a yoga studio where we could practice. I love trying out new yoga schools. At first, I enjoyed finding places that were mostly like my home studio, offering a vigorous vinyasa practice. But as my practice evolved, I enjoyed discovering new places completely unlike my home studio, and being challenged by the different styles of practice. These days, I enjoy trying new schools not just for the variety, but also because as a yoga instructor it is easy to fall into a teaching style rut. Attending different schools and practicing under different teachers is an incredibly enjoyable experience where I’ve learned new flows, ways to cue students and even discovered new music. The second studio we visited in Hong Kong was Flex Yoga, where we took May Nogoy’s lovely vinyasa class. It’s amazing what some hydration and sleep can do for one’s practice. I connected with May immediately, enjoying her flows and cues. After class, we chatted and discovered that we shared a Michigan connection. 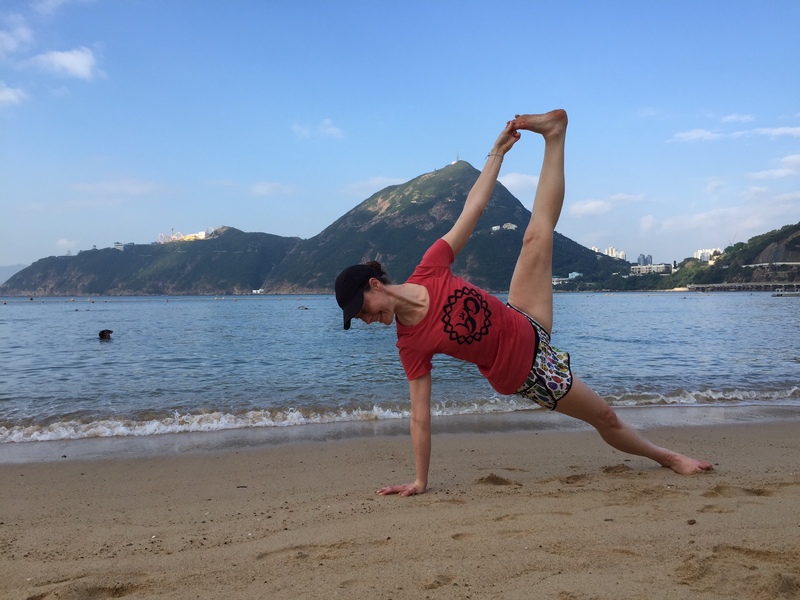 We traded stories of our yoga journeys and May provided us with tips on where to find good yoga all over Hong Kong. Her enthusiasm was palpable and contagious, especially when she spoke of Fun for Freedom Yoga* at Tamar Park, a weekly free yoga class she created for Hong Kong’s domestic helpers (maids), most of whom originate from outside Hong Kong, work 6 days per week and send much of their earnings home. Though family obligations prevented me from attending the event, meeting May reinforced that yoga teachers around the world are indeed keeping the commitment to seva alive by finding ways yoga with people. We practiced with May once more before heading back to the US having made a new friend. Some photo-ops are more tempting than others when it comes to yoga play. This one got the hubby a round of applause. Also at Flex, we attended a Hatha Chakra yoga class with Michelle Ricaille. Michelle, also an American transplant originally from Iowa, was a solid teacher, offering a very lovely and deep practice. Sometimes in the Vinyasa community we can be in love with constant movement, and practicing in the Hatha tradition – the foundation – can be a great thing. Such was the case as we slowed down and spent more time in the poses under Michelle’s guidance. Her class was a good reminder that a vacation is the perfect time to slow down your practice and get a little deeper – not just because everything else also slow down on vacations, but because one of the joys of a holiday is the break from your regular routine. On the subject of varying up one’s routine and being most pleasantly surprised, my favorite yoga class in Hong Kong was not the one I would have expected; it turned out to be a class unlike any I’d ever experienced before: Patanjali Yoga at Ananda Yoga. As a teacher, I have read Patanjali’s Yoga Sutras (the “original” text on yoga, which is estimated to be about 1700 years old). Since then, yoga has grown and evolved from calisthenics for boys to intricate and artistic flows choreographed to music, but the end goal is (more or less) the same: to integrate the body and mind so the practitioner can meditate. I am very much a modern yoga practitioner – I was driven to yoga by my love of dance and movement, and found in it the added bonus of mental clarity. The yoga I practice and teach is very much western, and this made my experience at Ananda an unexpected and wonderful one. For every bit of choreography that my usual classes have, teacher Lakhi’s class had none of it. After we sat quiet and cross-legged to begin, he delivered instructions succinctly without any fancy bits of wisdom offered in between. The first part of the class felt more like a gym warm-up, but I recognized it from my study of yoga history. We then moved on to the yoga poses, which were traditional and held for counted breaths. Lakhi offered adjustments, which ensured the simplest poses were made even more challenging. After class, as we approached to thank him, he said, “you did very well. You are very strong,” and that was that. Although I am fairly sure that I will stick to vinyasa in my own practice and teaching, the opportunity to practice in this style reminded me that the basic yoga poses really do offer plenty of challenge without the need to throw in intricate flows, longer than usual flows or complex arm balances. I really understood why some of the teachers I respect the most, like Seane Corn, have simplified their own practice and how they teach. On my first day back at my home studio, I embraced my teacher and thanked her. I told her my latest trip had helped me understand that your practice really is in you, regardless of where in the world you land. On this trip, more than in the past, I’d realized that if your yoga practice is consistent, you can take it almost anywhere around the world, step into a yoga school, enjoy a new experience, and leave with new friends. Don’t be lured by the studios that come up at the top in Google searches. Instead, reach out to locals (if you know any) to find the best yoga opportunities, running routes, etc. The MindBody app can be a great resource, too, expecially if you are not as familiar with your surroundings and you need to find a studio based on proximity. The MindBody app also makes it easy to read reviews of potential studios. Hydrate, hydrate, hydrate. Traveling is bound to dehydrate you (especially on longer flights), so if you hit the mat soon after landing, be especially kind to your body. This is not the time to expect your best practice or try to see if you can get into scorpion. Don’t be afraid to mix it up. Try different schools, different teachers and different styles. If you know for certain you are not a fan of a certain style of yoga, then choose classes that are more in line with what you enjoy. This is of particular importance if your class adventure turns out to be a $50 one. Unless you plan on being in a place for a month or more, we wouldn’t recommend purchasing a package at a studio or a gym. On vacation, even the most disciplined practitioner is bound to miss a day or two and leave paid classes behind. There are always exceptions, of course – but be honest with yourself regarding how many classes you will realistically attend. Also, if you’re like me, get your math-able spouse (or buddy) to calculate whether purchasing a package really does offer you substantial savings over drop-in classes.